Two McGill researchers will benefit from the latest round of funding from the Collaborative Research and Training Experience (CREATE) program of the Natural Sciences and Engineering Research Council of Canada (NSERC). 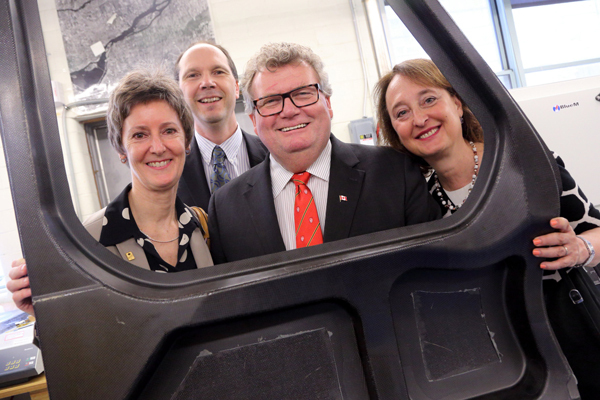 They are among the recipients of over $14.8 million in funding announced today by the Honourable Ed Holder, Minister of State for Science and Technology, at an event held at McGill. One of the McGill recipients is Prof. Murray Humphries of the Department of Natural Resource Sciences, who studies the sustainable development of the North. The second is Prof. Stephen Yue, Chair of the Department of Mining and Materials Engineering, who heads the McGill Institute for Aerospace Engineering. The CREATE program is designed to improve the mentoring and training environment for graduate and postgraduate students by giving them the opportunity to enhance their professional, communication and collaboration skills, as well as providing experience relevant to both academic research and non-academic environments. It is aimed at providing a value-added experience to the university training environment to better prepare research trainees for their future careers in industry, government or academia. “As industrial activity expands in Canada’s northern regions, whether it is mineral exploration and mine development in Nunavut or commercial forestry in northern Alberta, we need to be prepared to develop our resources in a way that is environmentally sound and sustainable,” says Prof. Humphries, lead researcher of the CREATE program for enhancing Canada’s prosperity through innovative environmental assessment, monitoring and management ($1,650,000). Graduates of the program will receive their core training and do their thesis work in environmental sciences (including conservation, wildlife management, ecology, biodiversity, and environmental health). In addition, trainees will conduct internships with industry, government agencies, and aboriginal organizations. “Northern development is dictated by a triangle, with industry, government, and aboriginal organizations situated in three corners, and sustainable solutions found in the middle. Time well spent in each of the corners will equip our trainees with the knowledge and relationships required for career-long contributions to the productive middle-ground,” says Humphries. With program nodes at both McGill University and the University of Alberta, the CREATE program is designed to train the next generation of natural resource consultants, managers, land use planners, and policy makers so they are ‘market-ready’ to enhance Canada’s competitive position and reputation as a country that efficiently develops its natural resources while maintaining rigorous environmental standards. The CREATE program in competitive manufacturing for the aerospace industry: technology and design ($1,650,000) is spearheaded by the McGill Institute for Aerospace Engineering, in collaboration with the Consortium for Research and Innovation in Aerospace in Québec (CRIAQ). This training program will prepare graduate-level engineering students to step directly into industry from university research projects, thereby helping to maintain and expand Canada’s strong presence in the global aerospace industry. The program will enable students to develop a range of personal and professional skills and a better understanding of aerospace design and production processes, through a series of workshops and seminars, many of which will be offered by the aerospace industry. A closely mentored work term of at least four months will round out the program.